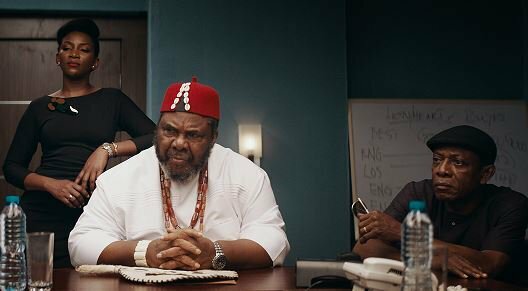 When her father falls ill, Adaeze (Genevieve Nnaji) steps up to run Lionheart Transport, the family business. Alongside her quirky uncle (Nkem Owoh), Adaeze must prove herself in a male-dominated world. Lionheart is Nigeria’s first Netflix original and we couldn’t be prouder or our Genevieve. I am sure Netflix were convinced to get on board this film by the simple and exquisite way Lionheart was shot. This is Genevieve’s directorial debut (as against the belief that she directed Road To Yesterday) and I must commend her for the work she put in this film as it turned out to be a decent film. Lionheart highlighs the strength of a woman in business and this will help the feminist movement pervading the world these days. Lionheart gets most of its charm from it’s locations in Enugu and Kano and the aerial shots of these locations further heightened the experience of the film. Also, the use of simple and sometimes natural lighting also gave the film a feeling of coziness and relatability. Another highlight of the film is the cast drawn from old Nollywood as Genevieve relied on the veterans like KOK, Onyeka Onwenu, Ngozi Ezoenu and the legendary Pete Edochie who put in decent performances reminisce of the good old days of Nollywood. All the principal cast did a fantastic job highlighting the Nigerian culture they represent and they executed this with authenticity. Even though Lionheart is a decent movie, but honestly it wasn’t that entertaining because it lacked a bit of everything. I was rooting for this film, I really was, but quite frankly, Lionheart wasn’t pleasurable because of some flaws with the script and the directing. Though the plot is simple, its development was a bit lackluster and the climax was…anticlimatic. Furthermore, in an attempt to keep the film simple, the producers left out so much detail especially those to do with the boardroom politicking and even the basics of how companies work thus making the film seem very unrealistic and annoying even. These highlighted flaws with the script and directing affected the cast of the film because even though they are seasoned professionals, there was no exceptional performances from them…and yes, this includes Genevieve herself. I guess this is because there really wasn’t much to work with and these imperfections led to some really unrealistic scenes in the film. I don’t want to come off as unsupportive of Lionheart (or Nollywood) but we have seen better films from Nollywood. However, I still hail Lionheart and Genevieve for producing Nigeria’s first Netflix original, hopefully paving the way for others into that market. Do you agree with my review, you can sound off in the comment section below or on my Twitter and Facebook. I will try to put aside all bias while watching this movie; I hope the hype was worth it. Onyeke O should nominated for best supporting actress. The real hue in every scene was really cool; Reminded me of Mo’ Abudu’s burnt orange. Her hair stylist Did well. Genny wore same dress for two days….not good. Nkem had amazing luck; he just cost Yahoo-Yahoo guys good money and they let him walk away…. And did I hear this is not the CHANGE…..? ?‍♀ is she still pals with Atiku? And the North and East transport companies merger…..sounds very Atikulate. The boardroom scenes tire me. With a little research they would’ve gotten it right. Then the scene with the 419 people was also off.